Suffering from stomach problems again? You’ve tried every medication, therapy, and diet. The list of healthy foods that you can eat can be counted on one hand. Does this sound all too familiar? You are not alone. Many people have gastrointestinal disorders. 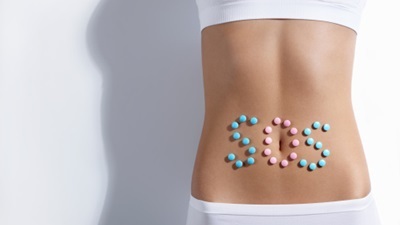 In fact, about 20% of the adult population suffers from irritable bowel syndrome (IBS) and more than half are females! No wonder you find dining out is so stressful. It is very common these days to be diagnosed with an allergy, intolerance, or syndrome and figuring out the problem makes it a lot easier to manage the symptoms. However, if the doctor can’t diagnose you or the root of the problem can’t be pinpointed, what can you do? Symptoms of abdominal cramping, bloating, diarrhea or constipation can severely impede on your life both physically and emotionally. Frustration doesn’t even begin to describe how you’re feeling, especially towards healthy foods. While the average person may experience mild disturbances in their bowels after meals and during times of stress, people suffering from IBS have a much more sensitive gastrointestinal tract and therefore have a much stronger response to these factors. This means that the presence of food, the kind of food, and the amount of food all contribute to gastrointestinal discomfort. If you’ve already tried avoiding endless lists of healthy foods that are known to exacerbate your symptoms and you are still not sure what’s causing them, consider avoiding FODMAPs. FODMAP stands for fermentable oligo-, di-, mono-saccharides and polyols. Although this may sound like a bunch of jargon to you, these are a group of indigestible carbohydrates that remain in your intestines, producing gas and other distressing symptoms. A recent study evaluating patients with IBS prospectively followed 90 participants over a period of almost 16 months. The patients had a significant improvement in many of their symptoms including abdominal pain, bloating, flatulence, and diarrhea, after receiving dietary advice and guidance on cooking methods, and eliminating FODMAPs. Lactose (for those with known lactose intolerance).Milk and dairy products will increase gas and bloating. Healthy eating with a FODMAP-free diet has been shown to be beneficial for IBS as well as other gastrointestinal disorders including Crohn’s disease or ulcerative colitis. This may be the solution to eliminating your struggles in your daily living. You may have adapted a gluten-free diet thinking that gluten was the culprit. A gluten-free diet has been shown to be beneficial since it contains minimal FODMAPs, but understanding how FODMAPs can affect your digestive system is necessary to rid yourself of painful symptoms and enjoy your healthy foods again. Whatever you decide, remember, you are the expert when it comes to your body. Only you know what works best for you. Consider speaking to your physician or dietitian and working with them to see if this diet is right for you. After all, you don’t want to give up your healthy eating plan or any of your favorite healthy foods.